Click on the image for a higher resolution image (284 Kb). 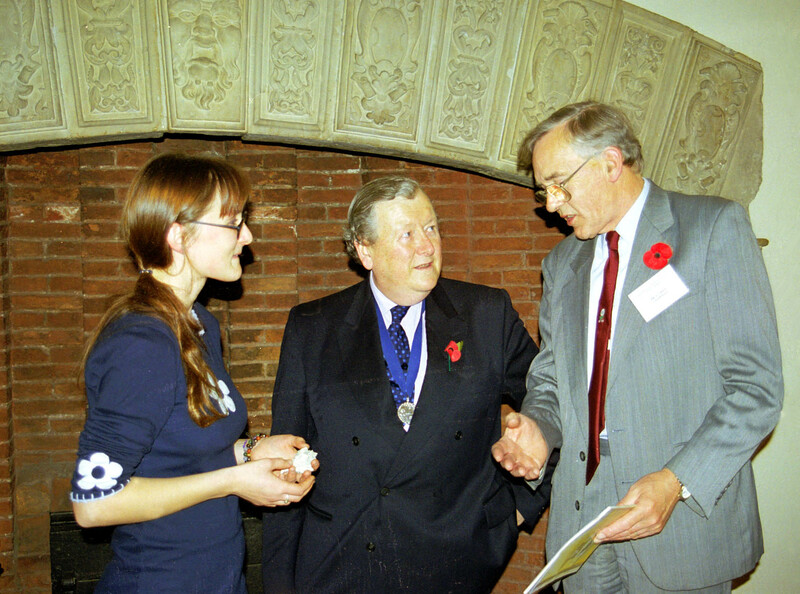 Photograph - From left to right: Charlotte Stokes (Department of Archaeology), Peter Addyman (President of the Yorkshire Philosophical Society, Director of the York Archaeological Trust and a Visiting Professor at the University of York) and Alan Owen (Chairman of the Yorkshire Philosophical Society) at the presentation ceremony in the Huntingdon Room in King's Manor (Photograph by Mark Beech). On the 9th November 2000, Charlotte Stokes from the Department of Archaeology was presented with the Charles Wellbeloved prize. This is an annual cash prize awarded by the Yorkshire Philosophical Society for the best dissertation by a third-year student from the Department of Archaeology. The title of her dissertation was: "The Neolithic Shell Eaters of Dalma: an analysis of the shell material from Dalma Island, Abu Dhabi". During this research she investigated a 7000 year old shell assemblage excavated from a Neolithic coastal settlement located on a small island off the coast of the United Arab Emirates in the southern Arabian Gulf. The inhabitants of Dalma island relied heavily on marine resources for food, and consumed large quantities of pearl oyster, venerid clams and turban shells. Charlotte's analysis of the molluscan remains from Dalma identified a change in the selection of shell species consumed through time, as well as an apparent size decrease in two species. These changes may be linked to over exploitation of the neighbouring coastal environment. Charlotte's work made a valuable contribution towards an ongoing project called the Abu Dhabi Islands Archaeological Survey (ADIAS). This project was established in 1992 on the directives of His Highness Sheikh Zayed bin Sultan Al Nahyan, President of the United Arab Emirates, and operates under the patronage of His Highness Sheikh Mohammed bin Zayed Al Nahyan. The Project is charged with the responsibility of surveying, recording, and, where necessary, arranging for the excavation of archaeological sites on the coast and islands of the Western Region of Abu Dhabi. Together with Mark Beech from the Department of Archaeology, Charlotte will be going to the United Arab Emirates in April 2001 to continue the study of further archaeological material from this project.